When thinking about ways to enhance your baseball memorabilia collection, you often have to think outside the box. Sure, you could pick up rookie cards of guys like Tanaka and Abreu this year, but won’t everyone else be doing the same thing? After all, those guys both had plenty of attention as they came into the league and no one will be surprised if and when they become stars. In order to set your collection apart, you need to be more creative than other collectors and find players who aren’t so highly regarded just yet, but have the potential to reach great heights at some point. 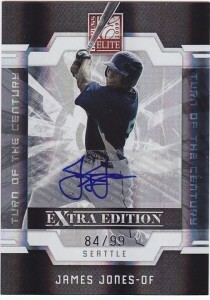 James Jones of the Seattle Mariners is one player who fits this mold perfectly. You won’t find his name high on any prospect lists, but he has plenty of tools and the opportunity to make an impact in the Major Leagues this season. He has moved into the role of the starting center fielder for the M’s, and has at least one hit in every game which he has started (breaking a team record held by Edgar Martinez along the way). Baseball is a game about tools, and Jones has plenty of them. The first one that you will notice when watching him play is the speed – incredible speed. Jones looks like he would be just as comfortable running track as he is on the baseball field, and that speed has already paid off in the form of infield hits and covering great ground in center. Beyond his wheels, Jones appears to possess a good eye at the plate, decent power to the gaps, and a rocket for an arm in center. As an indication of his arm strength, many teams were more interested in Jones as a pitcher than a position player when he was drafted out of Long Island University. So with all of those tools, Jones sounds like a sure thing, right? Not so fast. His minor league numbers have been good, nothing that would seem to predict future stardom. At this point, he has played just 19 major league games, so it is too soon to get overly excited about his .316 batting average. A good start? Yes – but that is all it is, at this point. Which is why James Jones deserves your attention as a collector. Outside of the Seattle area, he is pretty much an unknown at this point. There is a chance that he will never rise above the level of borderline Major Leaguer – but the potential for more is there considering his skills and natural athletic ability. Considering how easy it would be to obtain a couple pieces of memorabilia at this point, Jones is a player you should consider adding to you collection. If he does go on to reach great heights in the game, you will have some pieces that may escalate in value and will be fun to look back on.